Plenty of people in Japan are going bananas over the Morning Banana Diet -- so much so that there are reports of a banana shortage there as eager dieters gobble them up. What makes it so -- a-peeling -- and does it work? "Can you believe banana sales in Japan went up 80 percent in one week compared to the same week last year? I think that's crazy. Because it is crazy!" exclaimed registered dietician and Early Show contributor Kerri Glassman Friday. Under the Banana Diet, she explained, "You start with a banana, as many as you want, for breakfast, with warm water. You don't have anything until lunch. You have a basic lunch, which can be anything you want, even pizza and fries. Then (in mid-afternoon), you can have a snack, which can even be a sweet. Then dinner, which can be anything you want. It has to be before 8 p.m. Nothing after dinner, including sweets. Then, you have to go to bed before midnight." Co-anchor Maggie Rodriguez was skeptical, observing, "(You can have) as many bananas as you want (for breakfast)? Maybe the idea is you get so full, you don't want to eat a big lunch, or a big dinner?" "That's part of it," Glassman agreed. 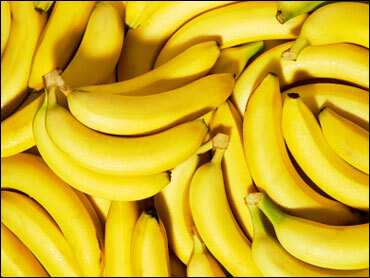 "Bananas do have fiber, and they're gonna help fill you up to some extent. But still, many people we know, no matter how many bananas you have for breakfast, (if) they're told you can have whatever you want for lunch and dinner -- you could be having a turkey sandwich, trying to lose weight, and then all of a sudden, you switch to pizza and fries -- you're gonna gain weight. "It's a recipe for disaster for most people. However, for some people, if you're eating, let's say, lots of sweets throughout the day, and now you're told you can't have any sweets except for one small sweet at three (p.m.), you might lose some weight. Also, for some people, if you're an emotional eater and you over-consume thousands of calories at night, you're gonna cut calories (with this diet). So, for some people, you may lose a little bit of weight, but for most people, it's a recipe for disaster." Glassman dubs it "a fad diet," noting it gives people rules to follow, and saying isn't the stuff of a roadmap for lifetime eating. She adds the warm water with breakfast actually appears to be a good idea: "Some people believe it helps with digestion. And it's common for some people to have the warm water in the morning. You're increasing your fluid intake in the morning, but this diet gives no explanation why (the warm water helps). The diet caught on inn Japan after a famous actress there lost 26 pounds on it and, Glassman says, "It was put on some social networking (Web)site in and people are going crazy, and half the testimonials, they can't even find the people. "For the most people, bananas are not a magical food. They're just not. They have fiber. They have protein. They have potassium. They're an excellent food that should be incorporated into your diet but, just like the grapefruit diet or cabbage soup diet, there's no magical food." Also, bananas "have some resistant starch. That is a type of fiber that passes through your system into your colon without being digested. There is some new research that shows it might actually help burn fat. Now, even if that's true and, let's say, it does help do that, there are other resistant starches out there, in potatoes, in beans. You still can't over-consume as many bananas as you want, and you still can't eat whatever you want, including steak and fries every day for lunch. "Incorporate bananas into a healthy diet. That's the way to go. But we still need whole grains and vegetables," among many other types of food.